Apple cider caramels, made from scratch! This is a small batch recipe, so start here before committing to a large batch of caramels! One more chewy, sticky sweet square thing; I swear. A few moons ago, I used to drive to the city (the city being San Francisco) and take the occasional pastry class at the Tante Marie. I had read a lot about it and become obsessed with it, and I wanted to experience the magic that is Tante Marie. It was always a different group of people each Saturday, though this I never understood. Most people do not bake because of all the dishes. But, in cooking school, someone else does the dishes for you. I mean, really–I couldn’t get enough of this life! In my own kitchen, I wash bowls in between prep steps because I have this tiny 1920s house with what must be a black-market miniature dishwasher. At cooking school, there was a polite lady who not only washed your dishes for you, but did it with a smile. She graciously accepted my pile of dirty dishes at the end of each 4-hour cooking session. I loved that lady. I wanted to kiss her every time I handed her 5+ spatulas and sticky bowls that should have been soaked from the get-go. So, one day in school, I wrapped up my pear frangipane tart early (though, it was a mistake I’ll get to in a bit), and I headed over to join a girl making Meyer lemon caramels. One of the many things I loved about Tante Marie was that the teacher of the class shopped at the farmer’s market that very morning for ingredients. It didn’t get any fresher. She had a heaped pile of Meyer lemons in the bowl, and the scent was downright intoxicating. So, we read the recipe through and thought ‘it can’t be this easy to make caramels, can it?’ Wow. Ok, let’s get started. In no time, we poured the molten sugar in a greased glass dish and high-fived each other for our work. At the end of class, we went around the room (while eating desserts) and talked about what we had made. My teeth were stuck together with caramel when the question was asked: “who didn’t peel the pear for this pear tart?’ Guilty. I thought the purple skin looked pretty against the yellow frangipan custard? I was wrong, apparently. But, I didn’t care because I had caramels. So, while I will stop inundating you with homemade caramels recipes on this site, I will not stop making them behind the scenes. I am in love. The married kind of love, not just infatuation. When one of you requested that I scale down Smitten Kitchen’s apple cider caramels, I jumped at the chance. As expected, Deb’s recipe is flawless, though it made too many caramels for a small household. I roughly cut the recipe in half and used my trusty loaf pan. I wound up with about 20 pieces of caramel. Well, 19 because the dog ate one. Apple cider caramels have all the things we love about caramels: sweetness, stickiness, and chew, but with the addition of punchy apple. Use the best quality local apple cider you can find, because we boil it down to condense its flavor. When it’s stirred into the caramel mixture, the acidity and apple flavor remains, and brings new life to the party. A little sprinkling of coarse sea salt brings out the nuanced flavors of caramelized sugar and apples, but you can skip it if your’e not a salted caramel person. But if you are, have you seen my small batch caramel sauce? In a 2-quart saucepan, boil the apple cider until it reduces to 1/4 cup. It should take about 30 minutes on high. Meanwhile, line a 9 x 5 x 3-inch loaf pan with parchment paper, and spray it with cooking spray. Once the cider is reduced, lower the heat and add the butter, sugars, and heavy cream. Raise the heat and bring the mixture to 255-degrees Farenheit over medium-high heat. Use a candy thermometer to ensure the proper temperature. Immediately stir in the cinnamon and salt. Then, pour the mixture into the prepared loaf pan. Let the mixture chill for 1 hour in the fridge. Slice it with a knife into bite-sized pieces. Oh girl, this couldn’t possibly be more lovely. Awesome recipe! I’m especially digging the salt on top. They do the dishes for you in culinary school?? WHAT?! Why did I not again??? :) Lovely caramels and beautiful pictures! These look sooo fantastic that I can’t even stand it! Ps… I would have loved your pretty tart! Gorgeous! How sweet would these be wrapped up for Christmas! Stephanie @ Eat. Drink. Love. I’ve wanted to make caramels like this for so long. Yours look lovely! Mmmmmm….. Can’t wait to try these!!! Totally making these today, veganified! Love the story and would love to have seen the dog eating one of these caramels? One gulp or did the dog try to chew it? Definitely could go for 20 of these! So I’m usually down with small batches, but if you wanted to make a big batch of these and provide leftovers,oh, say, next week, I would totally approve! Until then, I suppose I can try my hand at a batch of caramels too. Homemade caramels are my favorite! Your cooking classes at Tante Marie sound like sooooo much fun. Oh fantasy world where someone else does the dishes—-with a smile. At least you get to experience that in a limited way to know that its a great fantasy to envision. The caramels look impressive. I want this right now!!! It was my dream in high school to attend Tante Marie’s! I haven’t thought about that place in years. I just looked it up and it’s closed?! I could cry!! I’m so glad you were able to take classes there. These caramels are beautiful! Being a TX girl, I am unacquainted with Tante Marie’s but it sounds like my perfect afternoon! Plus, I can’t help but say it with a “fancy” accent which makes it that much more fun. I’d probably choose these caramels over chocolate. <– best compliment ever? love love love the small batch!!! these are so beautiful!!! I am seriously trying this!! Oh these are definitely happening soon! Thank you! Love that you shared it small batch and the pictures are beautiful as always. Pinning. P.S congrats on Huffington Post sharing your black licorice post. These are so pretty. Almost too pretty to eat. But I’d totally eat them anyway. I’m pretty jealous of your culinary school! I definitely had to do them at my school. So yours has major brownie (+caramel) points! Oh no, more candy making inspiration! You’re merciless! ;) I’ve thought about trying apple cider caramels a number of times but haven’t gotten around to it. Now I will. AND now I really need to try a Meyer lemon version too…thank goodness the holidays are coming up for an excuse to make them. 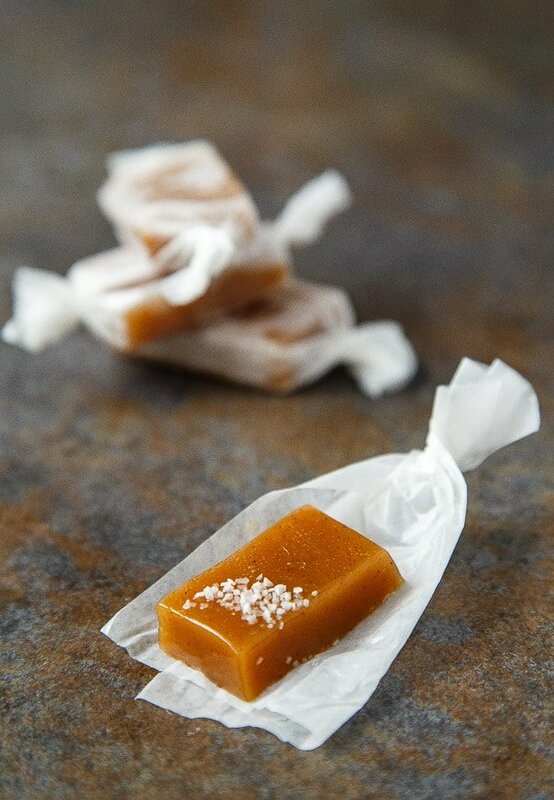 I’ve been wanting to make apple cider caramels for ages! Thank you for making a small-batch recipe–like Averie said, I don’t need 3,000,000 caramels lying around (especially with my wedding approaching rapidly). I love you and ALL your caramels! Small batch caramels. This is scary. Also, meyer lemon caramels?? Did I miss the link?? You can carry on with the small wrappable treats for as long you like! These look fabulous! 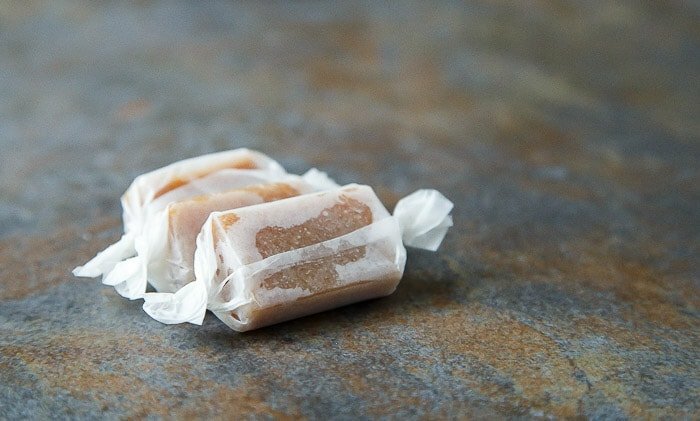 Nobody needs enough caramels around to feed an army because that just means more hours at the gym…because I have never met a homemade caramel that I didn’t like! Pinned! LOVE homemade caramels! 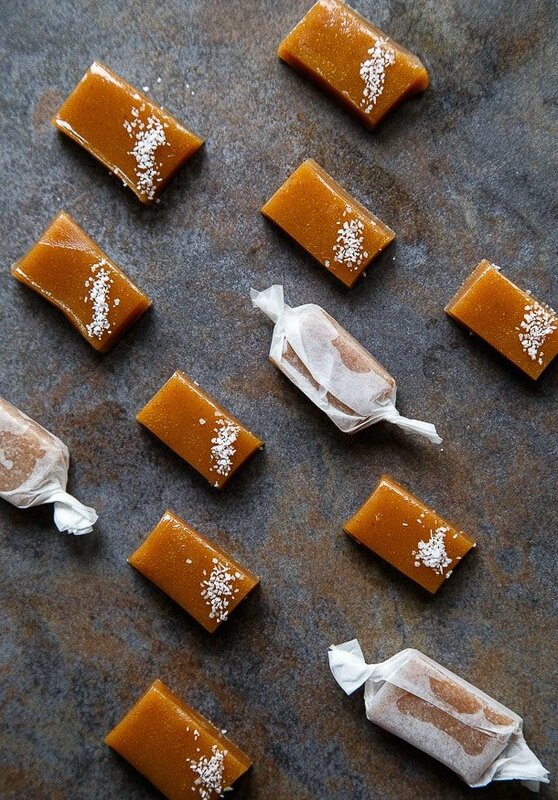 Cider caramels sounds like the absolute best fall treat ever. These caramels sounds amazing but have to second Cindy’s comment…. the Meyer lemon caramel recipe please? Ok I screwed it up, I think, but still yummy! Pingback: 50 Christmas Candy Recipes - Chocolate Chocolate and More! These sound delightful! Apple cider and buttery caramel together = yum. I can’t find apple cider anywhere! How does one line a loaf pan with parchment? Loaf pans have curved edges. Does the parchment need to be greased? You just kinda cram it in there, lol! It’ll have a few wrinkles/ creases, but don’t skip this because nothing sticks to parchment paper–nothing, not even tape! so if you don’t use it, your caramel will stick to the pan and be ruined. Extra greasing is not necessary. These look delicious! Do you have a small batch recipe for chocolate caramels? Oh yes! Have you seen those spatulas with built-in thermometer? Search on amazon for ‘thermometer spatula.’ So easy! I’m not entirely sure what boiled apple cider is…is it thick like maple syrup? I had a VERY bad experience making your other caramel recipe (I think the candy thermometer’s fault, not your recipe’s), so I was nervous about making this one, but I needed a last minute Valentine’s Day gift for my husband, so I made these during my lunch break yesterday. That’s right, I went from “maybe I should make caramels” to “caramel is chilling in the fridge” all during my lunch hour. I even ate lunch. Very easy (with a good candy thermometer) and delicious. I’ve eaten several myself, and I’m not usually a caramel fan. I would advise letting the caramel come back to room temperature, or close to it, before cutting.